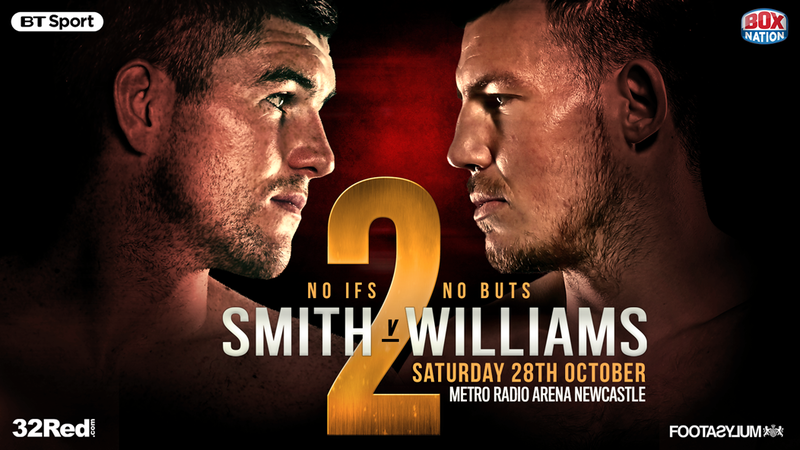 Clydach Vale clouter Liam Williams insists bitter rival Liam Smith is suffering from delusion as they embark on their spicy looking ‘No Ifs, No Buts’ rematch at Newcastle’s Metro Arena on Saturday week, broadcast live on BT Sport and BoxNation. The pair renews bitter acquaintance in a WBO Super-Welter eliminator seven months after a spiteful initial encounter in which the wounded Welsh warmonger was withdrawn after nine on medical advice, whilst ahead on all three scorecards. ‘Smith has been very dismissive of me since the last fight but I guarantee I earned his respect. What he rants publically and what he knows in his mind are two completely different things,’ claims the reigning British champion who has lost just once in 18. ‘I think I’ve got to him. Going in, I don’t think he could see himself getting beaten and he’s become utterly deluded. Now he knows the level of skill I bring. He knows the difference in class between us that I displayed for everyone to see in our first fight. ‘I’m one of the small percentage of fighters who doesn’t feel insecure about praising an opponent and Smith deserves credit for what he’s achieved in the sport. ‘He’s a class operator but he brought nothing that we didn’t expect. Sure, he was coming on strong at the end but we’d prepared for that. The Anglo-Welsh antagonists are unlikely to ever share Christmas cards and, one senses, their mutual dislike extends beyond the competitive one-upmanship of the sporting arena. But while the rumbler from the Rhondda has history as a hothead, he insists he shall maintain a calm countenance in the presence of serial smack talker Smith when the pair finally come face-to-face again in fight week. ‘Everyone knows that he’s the fiery one of the brothers but, this time, there’ll be no bad lip or aggression from me at the press conference or weigh-in. That’s all in my past,’ he says. ‘In recent gym spars, there’s been a few people who’ve tried to drag me into conflict situations but I’ve retained focus, remained professional. That might not have been the case 12 months back. I’ve matured. I know I’m a role model to some and I’ve kids myself. I don’t want to come across as a bad guy because I’m not.